There was no shortage of offense at Marv Kay Stadium in Golden, Colorado on Saturday. The Colorado School of Mines and South Dakota Mines combined for 126 points, as the Orediggers won 84-42. This shouldn’t come as a surprise. The Orediggers entered the game with the third-best scoring offense in DII football, averaging 46.4 points per game. The Hardrockers weren’t far behind, tied for sixth with 44.3 points per game. Both teams found themselves right at home in the end zone early on, as they headed to the half with the Orediggers leading 49-42. Here’s a look at some of the more mind-boggling numbers from Saturday’s offensive explosion. 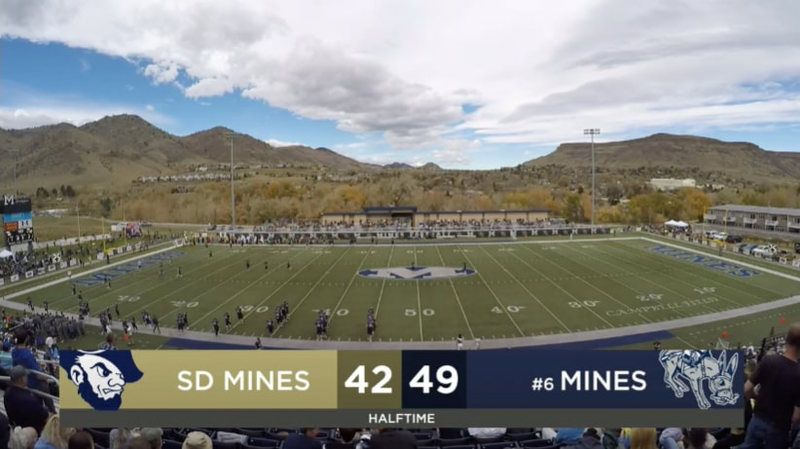 0 — Points scored by South Dakota Mines in the second half. It’s pretty remarkable that a team lost and still scored 42 points. It’s even more remarkable that all 42 of those points came in the first half. 4 — Wide receivers who pulled in more than 100 yards receiving. Isaiah Manley (147) and Joe Luebbers (107) did it for the Hardrockers while Sean O’Dell (129) and Brody Oliver (123) went over the century mark for the Orediggers. 5 — Number of touchdowns thrown by each starting quarterback. It was the Hardrockers’ Jake Sullivan’s second five-touchdown day in the past four weeks, and he has now thrown for multiple touchdowns in eight straight games. Isaac Harker tallied his fourth five-touchdown day of the season and has 25 touchdowns to just two interceptions in the last six weeks for Colorado School of Mines. 12 — Touchdowns scored by the Orediggers. Six came on the ground, five came through the air and one came on a fumble recovery to the house. That gave Colorado School of Mines kicker Scott Marshall 12 extra points, which set the school record. 13 — Total players who caught at least one pass. Seven Orediggers and six Hardrockers tallied at least one reception. 14 — Receptions for SD Mines wide receiver Isaiah Manley. He racked up a game-high 147 yards and four touchdowns. 57 — Career touchdown receptions for the Orediggers’ Brody Oliver. He set the RMAC record last week and added two more this week. 126 — Total points scored, the most this season in Division II. Colorado School of Mines’ 84 points is second-most to Virginia Union’s 90 this year. The Orediggers also have the third-most points put up in a game this season, scoring 72 on Sept. 29 against then-No. 24 Colorado Mesa. 151 — Yards rushing for Colorado School of Mines running back Cameron Mayberry. He also added four of the Orediggers’ 12 touchdowns. 209 — Yards the Orediggers outrushed the Hardrockers by. South Dakota Mines’ DII record-setting running back Conner Silveria didn’t register a carry. 425 — Yards passing for SD Mines quarterback Jake Sullivan, who had a 150.4 QBR for the day. 1,150 — Total yards by both teams. The Orediggers led the way with 654 yards, 259 of which came on the ground and 395 through the air. This is incredibly close to the combined season averages for both teams — 1,094.9 yards. The Hardrockers entered with the No. 1 total offense in DII football with 555.3 yards per game while the Orediggers were No. 2 with 539.6.